Rarely do clients come to Carroll Memorials with experience in purchasing a headstone for a loved one. As a result, the process can be somewhat overwhelming. Whether a client arrives with a specific design in mind or is unsure of what they want, we patiently guide our clients through every step of the process, letting you feel comfortable and in control. We never rush or pressure a client into purchasing a memorial. Carroll Memorials combines experienced and creative designers with the latest Computer Aided Design (CAD) technology to create high quality, personalized granite or bronze memorials. We strive to ensure that each client is as actively involved in the design of the headstone as they would like to be. Clients are first invited to explore our large display and review a variety of brochures and photographs prior to choosing a monument. Next, our designers sit down with each client and render a personalized image of the monument using the CAD technology. This allows us to make changes quickly and easily and provides both clients and staff with an exact template of the monument. All clients approve and receive a copy of this computer generated rendition of their monument prior to its fabrication. Carroll Memorials offers granite, bronze, slate, marble and natural rock memorials. We have access to a vast inventory of the highest quality domestic and international granite and maintain a large display on site. We work closely with clients to match the perfect material with each design, while keeping budget concerns in mind. 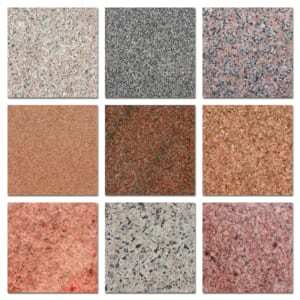 Due to our extensive relationship with both domestic and international granite and bronze companies, we have access to the highest quality materials and reasonable prices. Once completed, the CAD generated drawing is used to produce a vinyl stencil of the memorial design. This stencil is then used by our skilled craftsmen to carve each memorial. 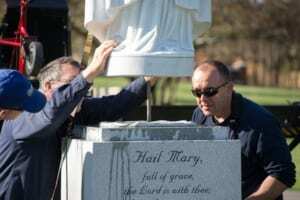 Once the monument is carved, the stencil is removed, the stone is cleaned and additional services such as shaped carving, hand carved letters, personalized etching, gold leaf, and raised lettering are completed. All details are double checked against the computer design and, if the client chooses, a final approval is set up prior to installation. Carroll Memorials works closely with the cemetery to ensure the proper installation of our memorials. As a result, we have an excellent reputation within the cemetery community. All stones are set to standard on hand-poured concrete foundations and are checked for accuracy and levelness. We take care to treat the surrounding areas with respect and give the stone a final cleaning upon installation.